This limited Edition contains a Bonus Music CD, 60 page deluxe booklet, and rigid box. 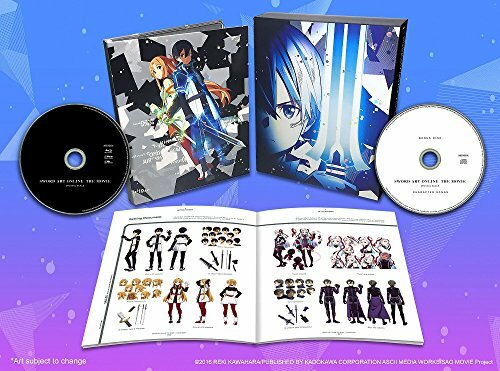 * After its overwhelmingly successful worldwide theatrical release, Sword Art Online the Movie -Ordinal Scale- makes its debut on Blu-ray and DVD! The NerveGear, the world's first dedicated full-dive device developed by the genius programmer, Akihiko Kayaba in 2022...a revolutionary machine that opened up infinite possibilities for the world of VR (Virtual Reality). 4 years later.... A next-generation, wearable multi-device called the Augma has been released to compete with the NerveGear's successor, the Amusphere. A cutting-edge machine boasting the ability to enhance AR (Augmented Reality) to the maximum, the Augma offers a safe, user-friendly experience, as it can be used while the player is awake, making it an instant hit. Its most popular title is an ARMMORPG developed exclusively for the Augma, "Ordinal Scale (a.k.a. OS)." Kirito is about to join Asuna and the others as an Ordinal Scale player, but they're about to find out that it isn't all fun and games... Special Features: Audio Commentary by creators and Japanese cast: Tomohiko Ito, Shingo Adachi, Reki Kawahara, Yoshitsugu Matsuoka, Haruka Tomatsu, and Sayaka Kanda, Special Short Animation: Sword Art OFFline -Ordinal Scale-. * *Bonus contents subject to change. Special Features subject to change. Includes English subtitles. If you have any questions about this product by Aniplex USA, contact us by completing and submitting the form below. If you are looking for a specif part number, please include it with your message.